The great outdoors holds great appeal to millennials. Of the 1.2 million households that went camping in 2015, nearly half were millennials. But as you might guess, a millennial’s style of camping is somewhat different than a baby boomer’s. 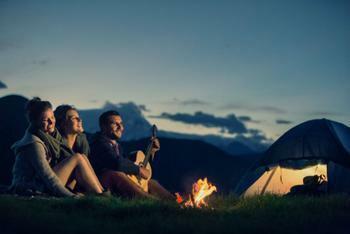 The quest for adventure paired with the allure of getting back to nature may be what drives millennials to go camping, but it’s amenities that make the experience enjoyable. When it comes to drawing the interest of millennials, campgrounds that boast stoves, ready-pitched tents, and Wi-Fi may have an edge over grounds that feature mother nature in her rawest form. Camping may offer a reprieve from technology, but millennials would prefer not to ditch the devices altogether. There are, after all, photos to be taken and shared. "We want that photo. For me, I want it for the memories, but of course, I think you could generally say that we want to post it and share it with our friends on Facebook and Instagram and Snapchat," travel blogger Trevor Morrow told CBS News. To those who insist that technology-laden camping isn’t “real” camping, Morrow counters by saying that everyone should be allowed to camp in a way that feels comfortable to them. Millennials’ quest for a comfortable camping experience has outdoor apparel manufacturers busy creating cool, user-friendly clothing. For brands like The North Face, appealing to millennials means showcasing the softer side of camping. Instead of featuring clothing geared toward extreme rock climbers, for instance, advertisements may feature clothing designed to be comfortable during an evening spent chatting around a campfire or watching a sunset on Big Sur beach. And for young campers who would prefer to camp in a cozy cabin rather than a tent, there are resources for that too. Sites like Hipcamp enable nature lovers to find a cabin in which to enjoy their next foray into the wilderness. Like Camping But Don't Like Roughing It?